Ray McKinnon believes the quality in both boxes was not good enough as Falkirk suffered a sixth successive league loss at the hands of Dundee United. 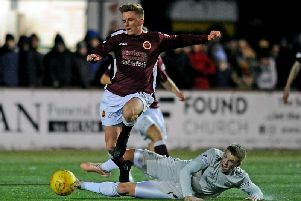 Pavol Safranko and Craig Curran headers gave United victory to pile more misery on McKinnon's men who remain bottom of the Scottish Championship. McKinnon lamented his side's defensive display and also going forward. He said: "In both boxes the quality was not what I was looking for. I think we have gifted them a goal and then missed two or three chances and then gifted them a second goal. "We're improving as a team there is no doubt about that I think if we take a couple of chances the scoreline is different. "We are where we are for a reason, we gifted goals today, we gifted them last week so we'll have to work on that but equally important at the other end of the park. "Wee things our affecting us right now if we're sitting mid-table he probably put that's in."